At the end of this post, please leave a comment for a chance to win $100 Visa gift card. Welcome to part three of my series titled, "Four Steps To a Worry-Free Kitchen Makeover." As a design professional, I know firsthand that for many homeowners the thought of a kitchen renovation is accompanied by anxiety over all the decisions that need to be made. I'm teaming up with Sub-Zero and Wolf to share my tips for each stage of a kitchen renovation to help put your worries to rest. Step One: Define Your Goals. Step Two: Find Inspiration and Create Your Design Plan. Today's post will address the third step: Executing Your Design Plan. In my experience the main topics that cause anxiety for homeowners at this stage of the game are; choosing the right professionals, making final decisions, balancing the budget and living through the actual remodel. The design board shown here is from a client project I'm currently working on. Using this project as an example, I would like to walk through the process of executing a design plan and offer my advice on each of these anxiety-inducing topics. The design board shown here is from a client project I'm currently working on. Using this project as an example, I would like to walk through the process of bringing a kitchen design plan to life. These particular clients are undergoing a complete kitchen remodel. They hired a local architect to design the new kitchen layout and a cabinet maker to build new custom cabinetry according to the architect's plans. They asked me to assist with material selection, finishes, paint colors, hardware, furniture, lighting, etc. In Step One and Step Two of the Worry-Free Kitchen RenovationI I mentioned, it's important to have the right professionals involved in your project from the beginning. In this case the homeowners have had previous experience working with the three of us and knew we were right for their project. If you are contemplating a remodel and aren't familiar with any local design professionals, trusted resources like Sub-Zero and Wolf's website can help. Their "Locate a Designer" feature can quickly provide a list of award-winning kitchen designers in your area. Once the plans from the architect were squared away it was time to start making final selections. First we met with the cabinet maker to choose the cabinet style and finish. Then it was time choose their new appliances. My clients visited our local Sub-Zero and Wolf showroom where they met with a kitchen specialist and selected their brand new rangetop and refrigerators. Visiting the showroom allowed them to experience and get hands on with Sub-Zero and Wolf appliances in full scale kitchen settings before they prurchased. The refrigerator they chose is the 42" wide Sub-Zero Over-and-Under with French Door. This particular model has the most interior capacity of any counter-depth French door model. In addition to a full size refrigerator, they also selected the Sub-Zero UC-24BG Beverage Center. This beverage center will be perfect for when they are entertaining as well as everyday family life. It offers built-in refrigeration for their new custom bar area. 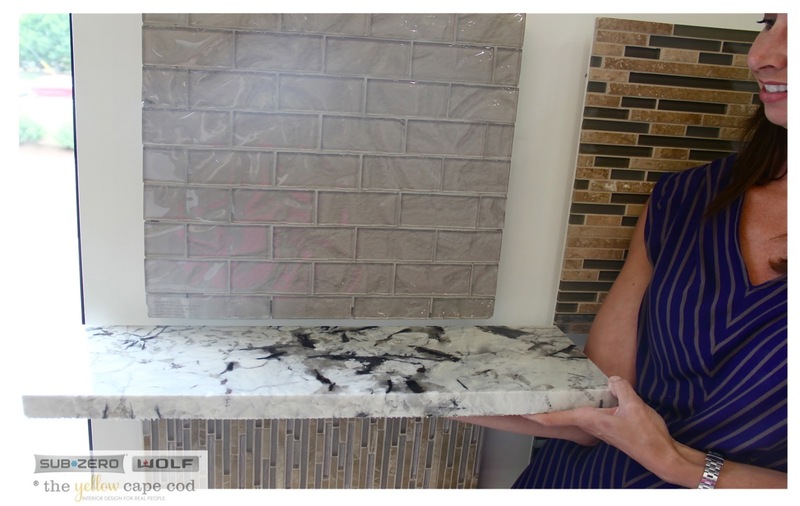 For the cooktop, they selected the Wolf 48" Sealed Burner Rangetop. They love to cook and this gas range offers everything a chef could want including dual stacked sealed gas burners that offer two levels of heat control. After checking appliances off the list, it was time for the three of us to start shopping for materials. 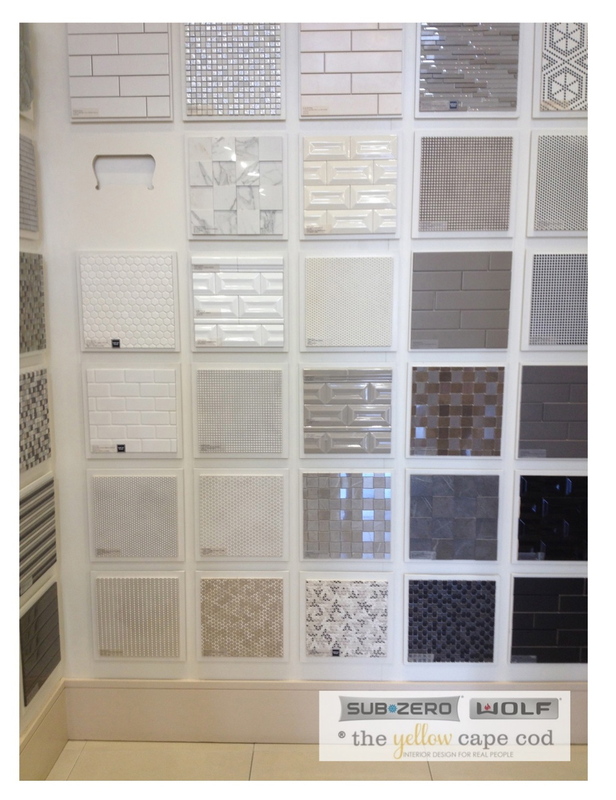 The photos used throughout this post were taken during our shopping trips to local tile and granite suppliers Ciot and Gennesse Cut Stone. The first selection we made was the granite. 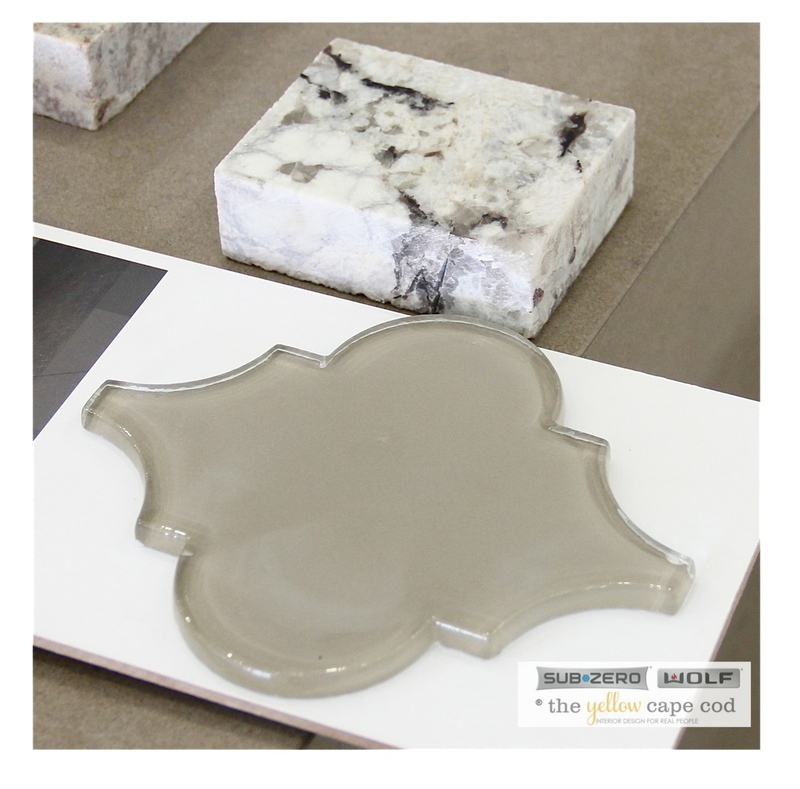 Choosing an important, main element like countertop material first can help make all the other selections easier. 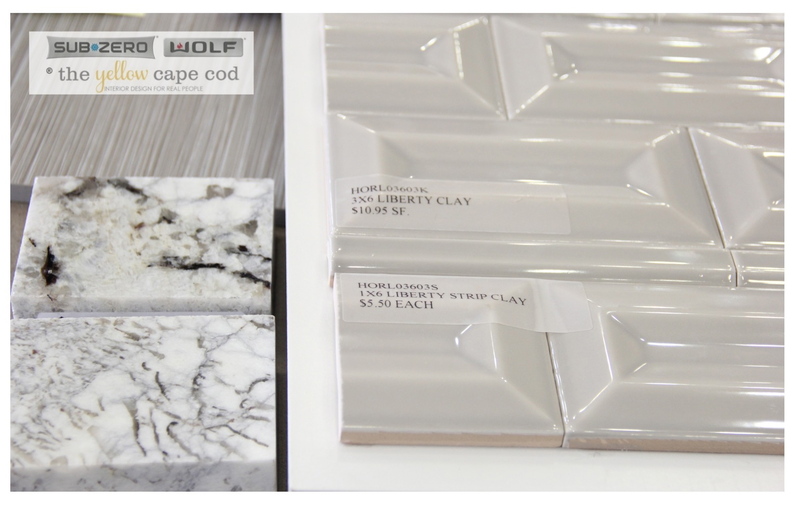 Using the granite as our color guide, we were able to narrow down our backsplash options. Since countertop material was one of the biggest expenses, choosing the granite right away gave us a place to start the budget management process. If sticking to a budget is a priority in your kitchen makeover, having your project managed by a kitchen design professional from the early stages will help keep you on track. Balancing the budget in a remodel is all about give and take. 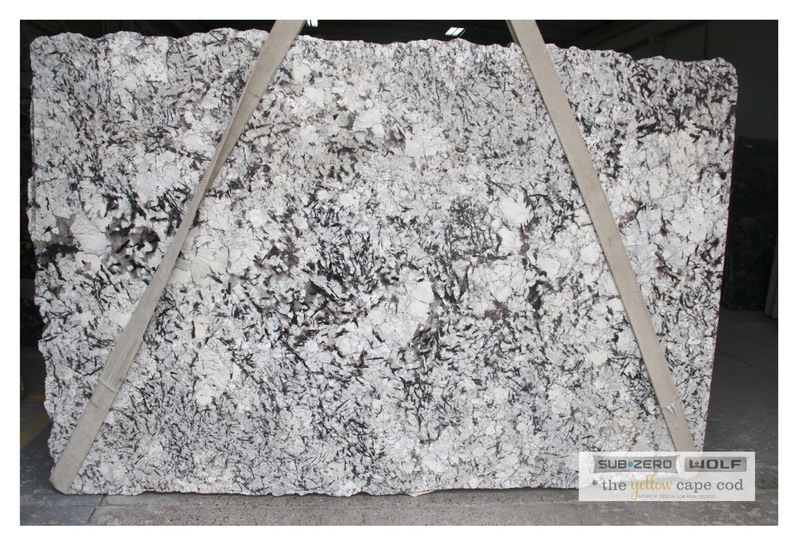 If you find a slab of granite that you are in love with, but it's pricier than your original granite allowance, you may be able to make up the difference in other areas. For instance, using budget friendly, off the shelf hardware as opposed to custom order could save enough money to make up for that more expensive granite. If making decisions like this on your own has you worried that your end result won't be the same, a kitchen design professional will know how and where to make appropriate budget friendly substitutions within the design. It's important to remember when you're planning a remodel that one change can sometimes lead to another. It's a good idea to leave room in the budget plan for unexpected expenses and/or add-ons. For example, while shopping for granite and backsplash tile for the new kitchen, we came across some beautiful tile flooring options for the adjacent pantry and mudroom. The materials we found really complement the new kitchen design and got us thinking about adding on to our project. Once all the design decisions have been made and materials have been selected, it's time for the work to begin. Whether you are living in your home through the remodel process or staying somewhere else, expect to be met with some inconveniences. In this case, my clients are living in their home through the entire process. They are prepared to deal with a mess for a few weeks knowing the reward will be a beautiful kitchen they will enjoy for years. Residential interior websites like Houzz.com are a great support center and resource for homeowners. There are many articles, like this one, related to living through a kitchen remodel that offer a ton of great tips and advice to make things a little easier. No matter how much planning goes into a remodel project, it's always best to expect something unexpected. As long as you go into your kitchen remodel project with realistic expectations and an open mind, the process will be much less stressful. If you are managing your own project, be prepared for the possibility of things like contractor delays or product backorders. If you are enlisting a kitchen design professional to oversee your project, they will help manage events like this. Stay tuned for the fourth and final post in this series. Join in the conversation and follow Sub-Zero and Wolf on Facebook. 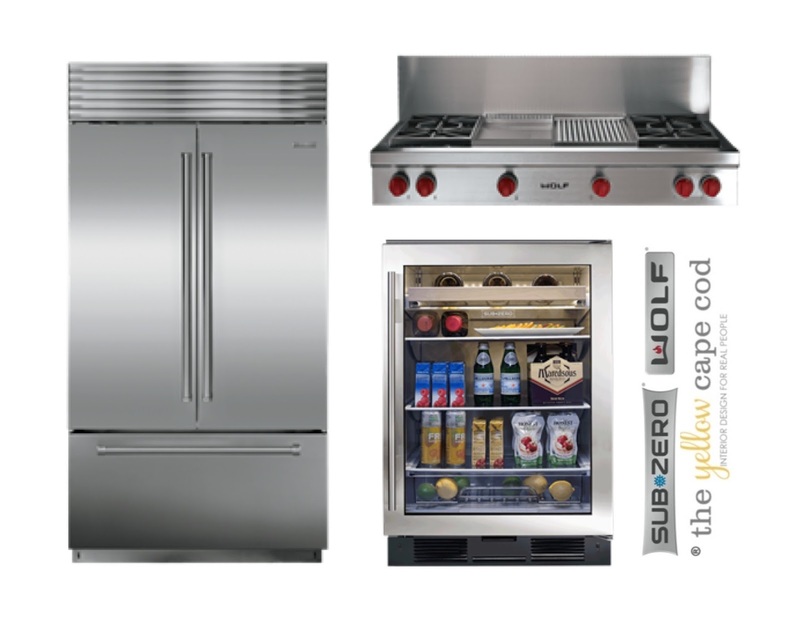 For more information on their appliances, visit Sub-Zero or Wolf online. How would you design your dream kitchen with Sub-Zero and Wolf? Let me know in the comments below for a chance to win a $100 Visa gift card! This sweepstakes runs from 8/19-9/16. Be sure to visit the Sub-Zero and Wolf brand page on BlogHer.com where you can read other bloggers’ posts. As always you have come through with another beautiful and inspirational design. I would be absolutely thrilled to have a new kitchen, but the thought is very overwhelming. You have broken it down to feel so much less intimidating. 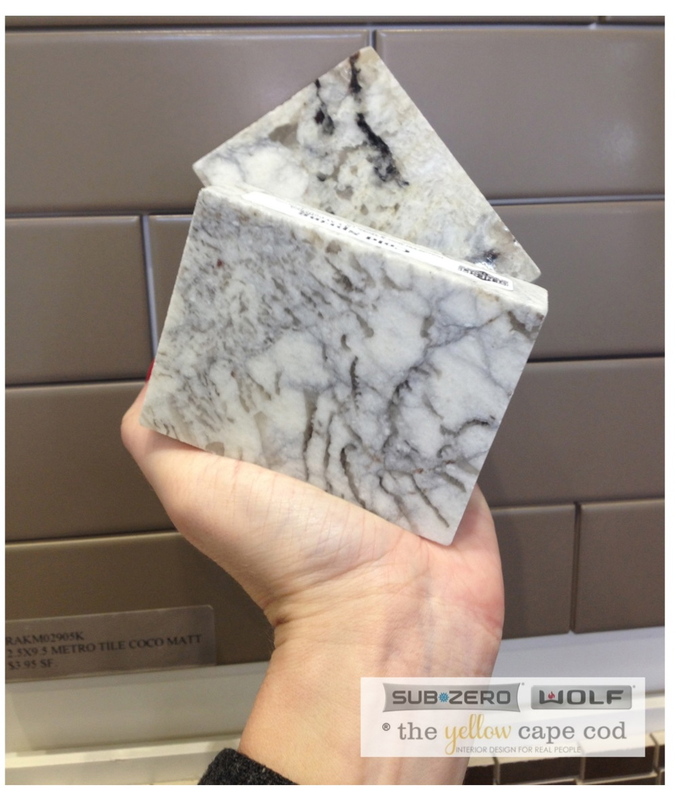 I would love the chance to win a $100 visa card from Subzero and Wolf to put towards my Kitchen remodel fund. i wold have stainless appliances; wood floors and cabinets in dark stain; island counter. I would get marble counter tops and all brand new smart appliances. Would love a chance to win. Love your choices. We just remodeled our kitchen and then had to move. Would love to redo my new kitchen. We are considering buying a home that will need renovating (including the kitchen), so these are all good things for me to be thinking about! Sub-Zero and Wolf appliances probably won't make it into my kitchen because they will be way over our budget. If I could design a "dream" kitchen, though, I would choose a double wall oven, a gas rangetop with a big vent hood, and a built-in fridge with a cabinet panel front. I would design my kitchen around the Sub-Zero and Wolf appliances! The refrigerator would be put in a much more user friendly location and the oven would require the removal of some cabinets. Love to dream of such great appliances! My dream kitchen ... yes, it could include a Sub Zero fridge and a Wolf range. And it would be a lovely dream! Thanks for the giveaway! We are currently in the process of remodeling our kitchen, and we've applied for a line of credit from our local bank to help finance this big undertaking. Every dollar will count, obviously, and I would love the chance to win $100 to help toward the purchase of new stainless steel appliances for my "dream kitchen." Fingers crossed! Great blog post. Very inspirational and helpful. 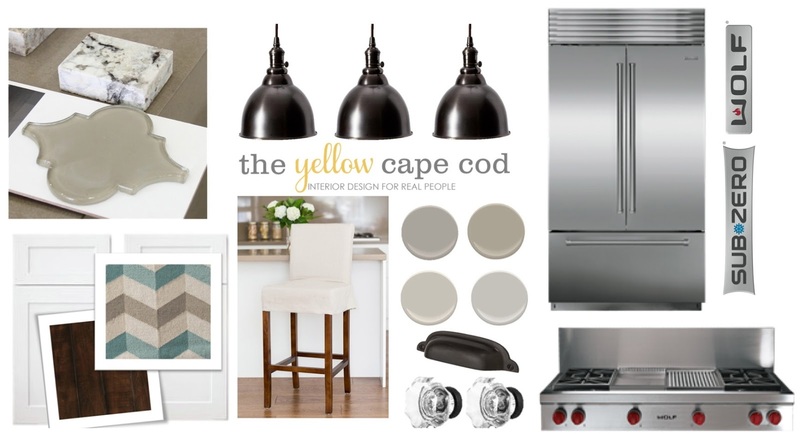 I'd redesign with a granite counter top in grey/white tones, new light fixtures, and a gas oven/stove! I would love to change out the kitchen lighting! I would like white shaker cabinets, a big gas range, French door refrigerator, black counters, white subway tile, a farmhouse sink, and lots of lights. Love the look and ideas! The Sub-Zero and Wolf Built-In Refrigeration & Wolf 36" Gas Range would be so nice to incorporated into my bright colored kitchen with granite countertops. Appreciate the chance to win! All of your selections are fabulous. That is going to be a gorgeous kitchen. I love the paint colors - what are they? I love your design choices....we are getting ready to paint our kitchen cabinets and counter top. Anxious and excited for the project to begin. The $100 visa gift card will come in handy for our upcoming kitchen make-over. Besides fab new appliances, I would love a farmhouse sink and more counter space and outlets. I would add a new gas cook top and new granite or marble counter top, some hardwood floors, and a bumped out window about my sink to let in extra light and add more space for some plants and décor. and I would add a built in warming tray like shown on the FB page. what a wonderful post from you....if i ever do a complete kitchen remodel these will be some great tips to guide me through it.....and i will certainly consult an expert such as yourself! My dream kitchen would have white cabinets some with glass fronts on the uppers to show off a few pretty and colorful things, white quartz counter tops, gray backsplash tiles similar to those in the Moroccan pattern you show in this post, wood floors and a Wolf stove would be icing on the cake! Our kitchen cupboards desperately need a make over! I need a kitchen makeover at a lakehouse! Love your blog! I'd love the 42" wide Sub-Zero Over-and-Under with French Door and gray/black granite counter tops. I would install new appliances in my kitchen such as the Sub-Zero BI-30U Over-and-Under Refrigerator/Freezer and the Wolf 30" Single Oven - L Series. I would also install new counters and cabinets. I would design my dream kitchen with sub zero refrigerator and wolf range and dark granite counter tops. Great advice and I like what your client chose! I'd love to have new appliances - mine are so outdated and on their last lives! I love this design board....especially the granite....that would be the first change I would want to make in my kitchen. 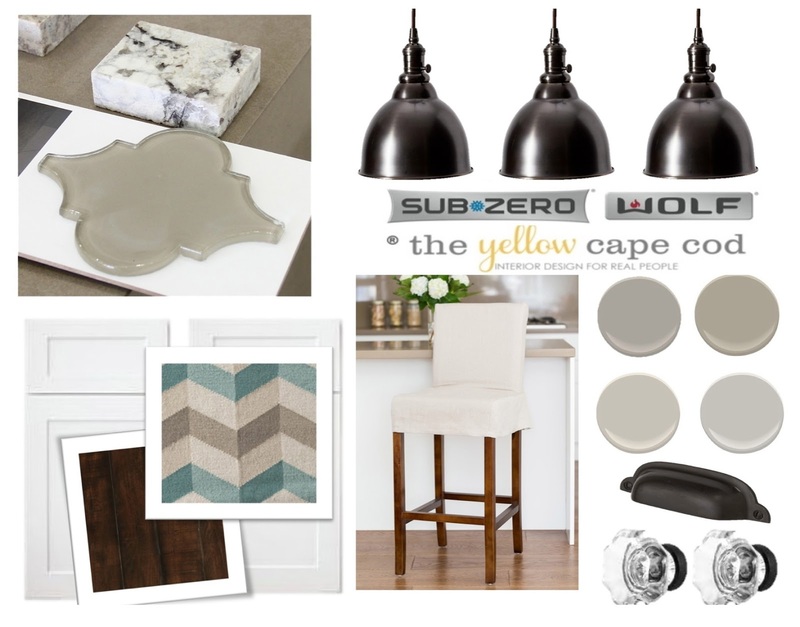 Oh the materials that you have picked out for this renovation are fabulous & I love the color combinations. Oh how I covet the kitchen with a sub-zero refrigerator. Beautiful design board. I've been thinking about upgrading our counters and backsplash for years but haven't been able to pull the trigger. Oh my gosh, I love everything on the design board! Great choices. I'd redesign our kitchen using Sub-Zero and Wolf appliance and bright whites with dramatic black accents. I'd get a fancy new stainless steel Wolf range and plan everything around that. My kitchen in from the 30s so it has tons of charm, just needs solid updates to our appliances. I really like all their products, but I would especially like to get an outdoor grill for my husband. I'd love a Wolf, a double wide fridge a farm sink an island and a colorful tile backsplash. I would love custom tile flirting in my kitchen. My makeover would have all new appliances, custom cabinets, granite counter tops and new flooring. My whole kitchen needs a make over -- a total redo. I would love to start with some of that gorgeous back splash as we have none and it drives me crazy. I would get all stainless steel appliances and a classy new granite counter -- maybe brown with some blue in it? I would like stainless steel appliances and lots of cupboard (and counter!) space. Your post is excellent! I think it was good that you mentioned "...that one change can sometimes lead to another." which can certainly lead to more time and expense. I would love to equip my kitchen with everything from Sub-Zero and Wolf! With three football-playing, teenaged boys, I'd love a giant fridge and a larger oven. We can only buy four gallons of milk at a time in order to fit the other necessary items in our current fridge. I love both of those product lines because they withstand the test of time. Great advice and love the appliances and materials listed. I've always loved the look of gray cabinets and black counter tops with stainless or black appliances! I would love dual fuel ranges and electric cooktops from Sub Zero Wolf in my modern dream kitchen. I’d love to cook with a Wolf Steamer! Your kitchen inspiration is beautiful! White cabinets, new stainless steel appliances, knobs and handles and curtains! I'd add a convection oven and huge fridge!! My dream kitchen would have a center island, granite countertops, stainless steel appliances and a Wolf Steamer!! My dream kitchen would include a Wolf 36" Sealed Burner Rangetop and a 30"-wide Sub-Zero over-under model with a glass door. I would love to have stainless steel appliances, rich dark cabinets, white/grey granite countertops, and dark flooring. Thanks for the giveaway! Those backsplashes are gorgeous! I would love to have new granite countertops, tile floors, new appliances new cabinets and an island. We are in need of a complete makeover/renovation in our kitchen, but are just in the planning stages. Thank you for the board information. Valuable!!! Love your blog and follow you on FB. Have a great day. I would buy a top of the line Wolf oven range, just in time for Thanksgiving! I would be happy with a new stovetop and a new sink. How? I think I would hire you! I love your choices above! I would like to have a big kitchen with Sub-Zero and Wolf appliances. Lots of cabinets and counter space. I would get granite counter tops, new tiles on floor, stainless steel appliances, and new cabinets. We've considered a kitchen remodel, but I'm not sure I could cope with the mess and upheaval. Your tips are super helpful though. My dream kitchen would have built-in over-and-under Subzero refrigerator, dual-fuel Wolf range, and a transitional drawer microwave. Thank you. Great advice - love your work! I would love to do marble countertops and put in all stainless steel appliances. I would get all new stainless steel appliances. I would love to have all stainless steel appliances! That would be a dream come true! I'd get a new stove as mine is from 1950 and WAY too big!